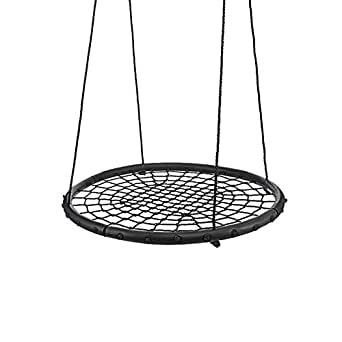 GREAT FUN & PERFECT GIFT - This giant saucer shaped swing is the perfect addition for your back yard. 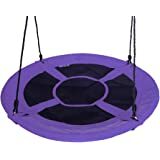 Both children and adults love swinging and lounging on the Jump Frog Giant Saucer Swing. Spin! Swing! Relax! Big enough for multiple people to enjoy!Check out all the great products from Gaorui for the perfect gift for your family! FREE TWO TREE STRAPS - Steel alloy carabiner with safety locking mechanism straps made from super strong industrial grade nylon.It can hold the weight of 3 POLAR BEARS.Better protect the tree! EASY TO INSTALL AND REMOVE FOR STORAGE - With Install tool.Swings ships in compact package and can be assembled in minutes! The swing is designed to work universally and easily attaches to swing set or hang from a tree! STRONG & DURABLE - Meticulously engineered with a steel frame, this super tree swing is built to last you and your family for years. Plus, the permeable material lets water drain so your kids won't get wet pants. 100% MONEY BACK GUARANTEE - Happy customers give us high ratings, so we're confident that you'll love it! We're SO confident that you'll love this tree swing that it's backed by our 100% Money Back Guarantee. If you don't love it ­ *for whatever reason* ­ we'll replace it or give you every cent back. That means that you either love it, or it's free! Ships from and sold by Gaorui commerce. 1.EVA foam padded steel frame, comfortable and safe for kids. 3.Assembles in minutes，with the screw and wrench provide. 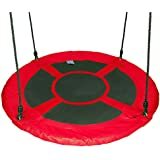 4.1Meter/40inch Diameter, large space allow kids to sit freely. 5.Approved quality, meet the safety requirements. This platform swing is the perfect place for hanging out with a friend. 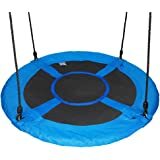 It features sturdy rope and a EVA foam padded steel frame in four pieces that assemble into 1 meter Diameter round shape platform.,Unique round tree swing allows kids to sit in a variety of positions brings the thrill of your child's favorite playground tire swing to your backyard.